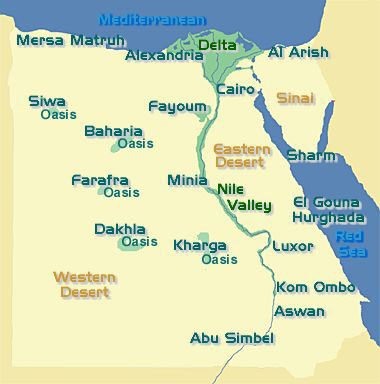 An oasis is an isolated area of vegetation in a desert, typically surrounding a spring or similar water source. Oases are formed from underground rivers or aquifers, where water can reach the surface naturally by pressure or by man made wells. An oasis provide habitat for animals and humans if the area is big enough. The location of an oasis is of critical importance for trade and transportation routes in desert areas. Caravans must travel via oases so that supplies of water and food can be replenished. In the Western Desert area we find five main oases: Siwa, Bahariya, Farafra, Dakhla, Kharga and the Faiyum. Most of these oases are densely populated. It is the Bedouin tribes in chief, who inhabit these oases regions.